North Korea’s largest-ever nuclear test had little impact on a South Korean people fraught with sorrow and recrimination following the suicide of their former president, according to media and bloggers here on Tuesday. South Koreans were puzzled by the timing of the Monday morning blast, which came only hours after North Korean leader Kim Jong-il sent his condolences for the death of Roh Moo-Hyun. On the fourth official day of mourning, tens of thousands of people continued to visit memorial shrines for Roh, laying white chrysanthemums in a traditional show of grief and leaving cigarettes on the altars to remember a man who was reported to have taken up smoking during the investigation. 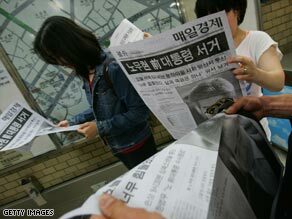 News reports about Roh’s death continued to top the “most read” counters of South Korea’s newspapers and Web sites.